This research monograph I have permission to share from the professionals at OODA Loop which is comprised of a unique team of international experts capable of providing advanced intelligence and analysis, strategy and planning support, risk and threat management, training, decision support, crisis response, and security services to global corporations and governments. 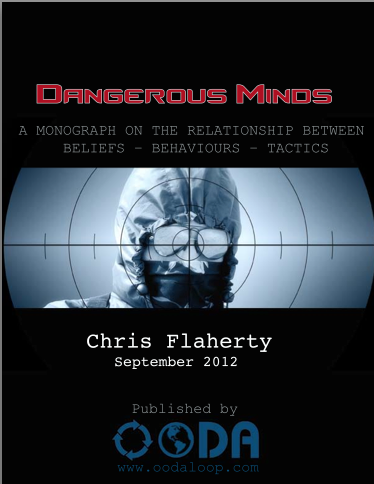 Dangerous Minds, examines the relationship between the individual beliefs, behaviours, and tactics of an attacker. It was developed out of work, following human factors research for a ‘Scripted Agent Based Microsimulation Project’, which is currently being developed at the University of Wollongong (NSW, Australia). Another contributing factor to the development of this research monograph has been discussion posts on the GroupIntel Network. This monograph is a collection of linked articles looking at the relationship between the tactics, behaviours, and beliefs that develop into a scenario study of next generation threats that can be identified from the study of various archetype attackers who have emerged since the 1980s. Broadly speaking, each of the chapters falls into a sequence of identifying first the concept of an archetype, illustrating different types of attackers based on specific events involving acts of terrorism, and extremism perpetrated by individuals and small groups. This is then followed by an analysis of how to identify future potential attackers, the types of attacks they are likely to make in the future, the tactics that are likely to evolve, and the factors that will influence targeting. Additionally, there is a focus on countering these future attacks. Summatively, this monograph is intended to base-line the information identifying individual characteristics of a selected group of loners and small isolated groups. It identifies the beliefs and personal behaviours that form the tactics used. These combine to inform a predictive model. Added to this monograph are the eleven one-page Terrorist Tactics Research Cards, that are contained in Appendix 1. These are intended as educational and training aids; and are also intended for use as one-page summaries of the main themes in this research monograph. Authored by Chris Flaherty over 2011, these have been written as a summary of key concepts and are intended to serve as an educational tool assisting tactical analysis of terrorist acts within a broadly related framework of 3D tactics in urban environments.